Sybarites » 2007 » September in Berkeley, we made some revisions to our own breakfast burrito. We added olives, jalapeño, fennel sausage and toasted anise seeds, which we initially thought were the same as fennel seeds, but our taste tests have determined to be sweeter with more licorice flavor. Refried beans added smoothness, weight and held everything together. Flour tortilla’s were substituted for corn tortillas, which worked well in the lighter version, but would have been too much with the beans and sausage. Fresh mozzarella, scrambled eggs, sour cream, cilantro, salsa, and avocado finish the ingredient list. We didn’t finish the food in the picture, flagging halfway through our second burritos. While breakfast burrito’s are a great treat, we usually eat yogurt with fruit and/or granola. Inspired by her cherry pie, Janet grated a little nutmeg on top of maple yogurt and bing cherries–simple and tasty. Ever since I tried the butternut squash pizza with the thin crust, I’ve been thinking about making a classic thin crust pizza. 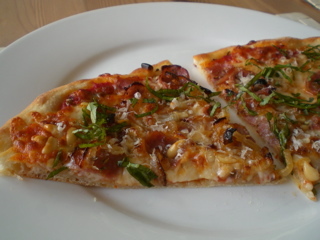 We topped ours with fresh tomato sauce, caramelized onions, anise seeds, fennel sausage, fresh basil, fresh mozzarella, pine nutes and Parmesan cheese. It’s definitely in the top three pizza’s I’ve ever had, with Gioia’s Pizza’s and Alegretto in Chile being the other two. Here’s something odd and rather gruesome: list of last meal requests in Texas. How or why this information was compiled and posted is curious; it certainly peaks the curiosity. What does a person choose for their last meal on earth, the last thing that will pass the lips, the last thing, arguably, to give pleasure before the end? It seems that Dr.Pepper, Coke, cheeseburgers, fried chicken, chef’s salad, steak, eggs and bacon are the foods of choice for many of the condemned, though there were definitely some interesting requests: “Cool Whip and a bowl of cherries”, “One bag of assorted Jolly Ranchers”, “Mexican Dish with all the fixings”, “1 jar of dill pickles”, “Eucharist”, “1 apple, 1 orange, 1 banana, coconut and peaches”. (Seriously, fruit? That’s your choice for last meal?) Clearly alcohol was off limits. And what about the people that requested no meal at all? Perhaps food isn’t high on the list of priorities at that point in time but I can’t even really speculate. Out loud, I wondered what Marc thought this list might contain if it were another country, like France, before I remembered that they don’t employ capital punishment… You can be sure there’d be lobster, though. And plenty of foie gras, wine and cheese. Zero cheeseburgers. Indeed, while reading the list, it was hard to miss the fact that so many people chose some form of hamburger as their last meal, though the details varied: double meat hamburger, “all the way” (everything on it? ), bacon double cheeseburger, old fashioned cheeseburger. So with all the variations on the burger, would one be allowed to specify how, or by whom, it was prepared? I mean, could one request a Quarter Pounder with Cheese, or a Whopper or “one what like my Ma used to make”? How disappointing would it be if your request for a last meal, to which one might look forward with a least a little relish, was unobtainable or fell entirely short of expectations? Like the guy who asked for “Shrimp and Salad. Shrimp not available. Served cheeseburger, french fries and cola.” I guess there’s no justice on death row. 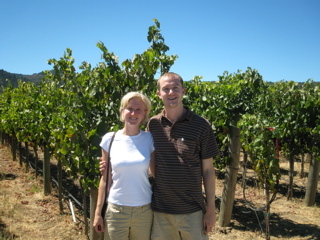 From this chain of thought, I recalled our recent, and first ever, journey into Northern California wine country, with Geoff and his girlfriend, Lucinda. 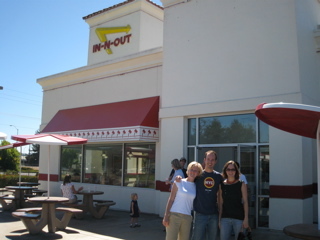 I know that seems a little off topic, but it was because we stopped for lunch at the In ‘N Out Burger at Lucinda’s request- dare I say insistence? It’s been awhile since she has visited California and a visit to the In ‘N Out is a mandatory item on her Golden State To Do list. Nobody in the car argued, because they do make a fine burger. So fine, in fact, that I think that might be what Lucinda would specify as her last meal- it would have to be In ‘N Out. That is, if she chose a cheeseburger, and if she were on Death Row, both of which seem pretty unlikely. Visiting a few vineyards in Dry Creek on a hot, sunny afternoon was a pretty sweet way to spend a Monday afternoon. I was more than a little surprised that we had such a successful day because a) it was Labour Day and surely we were not the only people inclined to drink, I mean taste, our way through the afternoon, b) we left when the city in the afternoon, and c) the Bay Bridge was closed for construction which meant the traffic on the Golden Gate was more concentrated than ever. It turned out that none of these things posed any kind of an obstacle and we happily sampled more wines than I can recall. Arguably, our favourite was the 2004 Unti Syrah, which we brought home and have since drunk with relish (but no mustard or ketchup). We had enjoyed the 2003 Syrah the night before at Saha, a Yemeni restaurant where we met Geoff & Lucinda, her Aunt Kate and mom, Ellen and thought we would be so clever to visit the winery the next day. Indeed, Lucinda was clever enough to arrange the whole thing, including the In ‘N Out luncheon. So we roasted a chicken. We have yet to find a butcher here so were obliged to obtain our subject from the Andronico’s market down the street. They actually have pretty good meat- good selection, good quality, less than good price… But the best organically raised, free-range chickens cost good money because they gave up their sweet existence so that we may swoon with content at the smell of their roasting flesh. And swoon we did, especially one of us (the one with four legs) who guarded the oven closely while the bird was in the oven. 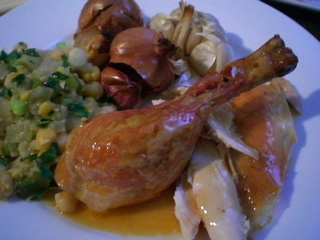 I was inspired to make this because of Nigella’s description of her roast chicken in How To Eat. The way she writes makes my mouth water; I can practically see her licking the butter off her fingers as she adds it to the gravy. And then she describes the variations on leftovers than can be created from the remains of a roasted bird with words like “unctuous” and “melting” and “relish” that it’s hard to resist racing into the kitchen to cook whatever’s on the page. This was the case with the chicken and it did roast its way to brilliance, with, thanks to her advice, extra crispy skin and extra gravy. For the first time ever, in the history of my existence, I did not make mashed potatoes to go with roasted meat. Travesty. If there’s any possibility of gravy, mashed potatoes must be on hand to pick up the slack, to sop up the jus as it runs off the meat and threatens to flood the vegetables. However, this time, not only did we not do potatoes, we did not do a traditional veg. Imagine! Instead, we had roasted garlic and shallots and Marc made some bright, chickpea salad. I’m almost convinced that a legume is the perfect halfway point between green and starchy; it went very well with the roasted meat but didn’t encourage gluttony, as a legume cannot hold onto gravy nearly as well as a mass of potato mixed with butter. I am almost convinced. I could never abandon starch. “Setting off to see another country, I set off to see what is more grandly other- whole cultures, geographies, languages. Who am I in the new place? And who are they who live there? How true! How exactly, perfectly, succinctly true. I read that and instantly thought of Istanbul, how when we were there, we rented a flat for two weeks and indeed shopped for figs and soap at local markets, played backgammon and drank tea at local cafes. There’s no question that we still stood out as the stupid foreigners we were, there was hardly any chance of us blending in, but going for groceries, or visiting the hardware store, or briefly getting to know the patterns of our neighbours and internalizing the Ramazan drumming at dawn to the point where we were no longer woken up by it, made me feel like I was just slightly less tourist and very slightly more a resident. The difference is the thickness of a strand of hair but it made me happy to carry a jug of milk instead of a camera and to think that the people who saw me perhaps thought “There is a foreigner who lives here” rather then “Look, another tourist”. A little of that feeling remains now that we are living in the United States. I am barely noticeable as a Canadian; until we speak in metric or use the word “toque” or have to show someone our ID, we are the Canadians that walk unnoticed amongst them. Most of the time, we are easily mistaken as Americans and I’m glad to blend in, the same way I was glad to blend in a shred in Turkey. I’m always especially pleased to be able to offer someone directions, and I’m asked often enough while walking the dog in the more touristy areas of town. Surely he makes me appear more a resident and occasionally, I am actually able to respond to a question in such a way that sustains the illusion; I wish I never had to say “Sorry, I’m not from around here…” and then not even be able to direct a visitor to a gas station for directions. But the longer we stay, and the more exploratory walks we take, the closer we will come to resemble San Franciscans, though I doubt we’ll ever shake the metric. 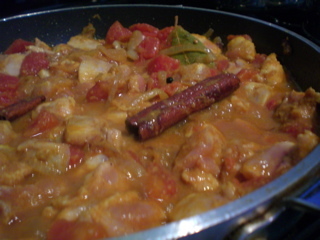 Meanwhile, in an effort to rekindle some of the travel vibe, and to use some of our souvenirs, we made a splendid curry. While in Udaipur, a man that we met, Krishna, set us up with a private cooking tutorial which involved an early-morning trip to the market and a lesson by his grandmother’s neighbour, a woman who cooked in a tiny, concrete kitchen tacked onto the rooftop courtyard of her building. After our lesson, Krishna obtained two sets of spices for us; we had told him we were not married so he had assumed that we lived apart and would, therefore, each require our own samples of curry, turmeric, cardamom and saffron. As a result, we have alot of spices to go through, a pleasant enough chore. This curry ploughed through a fair portion of the turmeric but we used whole cinnamon, bay leaves and cardamom pods. 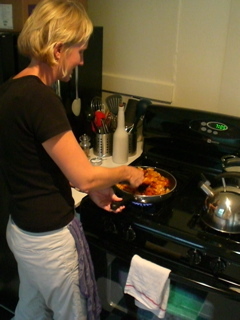 We also used two burners, which is one more than Krishna’s grandmother’s neighbour had. There’s no way we could’ve remembered and/or duplicated the chapatis she taught us to make- that will take an afternoon of patience and practice someday, an afternoon when we can invoke some travel memories of what it was like to cook in someone else’s kitchen.